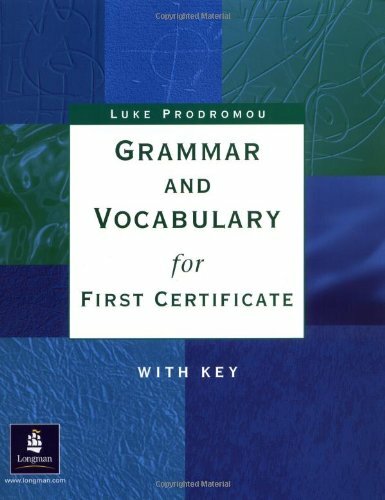 [PDF] Grammar and Vocabulary for First Certificate: With Key | Free eBooks Download - EBOOKEE! Description: *Designed for Upper Intermediate students. An innovative approach particularly relevant to the Cambridge First Certificate Exam (FCE) *Thorough grammar review. Detailed information concentrating on points tested in the exam, and a wealth of examples based on the Longman corpus. *A focus on vocabulary. Concentration on word formation, confusable words, and on common words and phrases that are useful in numerous situations *Lots of opportunity to practise. A wide variety of exercises to confirm understanding and prepare for the FCE exam, particularly Paper 3. *Continuous testing in exam format. A diagnostic test for each Unit and regular tests in exam format to check progress. *A flexible approach. Can be used in many different ways clear cross-references point you in the direction of related grammar or vocabulary areas. No comments for "[PDF] Grammar and Vocabulary for First Certificate: With Key".